The only reason I haven’t finished The Munich Girl by Phyliss Edgerly Ring yet is that I don’t have a lot of time to read, because I’m really enjoying this historical fiction story so far. Hopefully I will be able to finish it before the weekend! And I haven’t actually read any new pages of A Court Of Mist And Fury by Sarah J. Maas since last week, so process is still minimum. It’s not that I don’t want to read it, but I wanted to finish other books first. Three books sounds like a lot when I didn’t have a lot of time, but when I wrote last WWW I had the first title already almost finished… And the other two are a collection of short stories and a novella, so supposedly ‘quick’ to read. * I really enjoyed the Sherlock Holmes retelling A Study In Charlotte by Brittany Cavallaro, and I will definitely be looking out for the sequel. Fast-paced, entertaining and it really shows the main characters were based on the original duo. 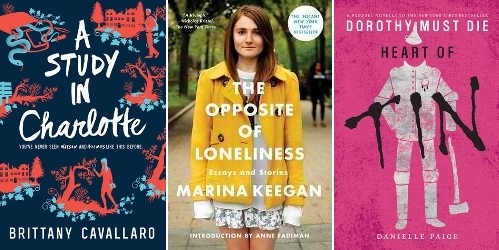 * The Opposite Of Loneliness by Marina Keegan wasn’t as good as I was hoping for, but I guess that was mostly because I didn’t realize there was going to be a fiction part. I didn’t really like the fiction stories in general, although there were a few exceptions. The non fiction essays are really good though. * I don’t like to say this about any book or novella, but reading Heart Of Tin by Danielle Paige was simply a waste of time. I REALLY didn’t like this sappy romance story where all that happens is that the Tin Woodman pines over Dorothy and tries to win her over… But since I’ve been promised this is the worst novella and the others are better, I will still read the next two. I have a new ARC pending:Cascadia by H.W. “Buzz” Bernard. It promises to be an adrenaline-filled suspense story about the after effects of extreme natural events (in this case a massive earthquake and tsunami), and I’m definitely looking forward to read it soon. And I decided to keep both Tell Me Three Things by Julie Buxbaum and The Ex by Alafair Burke on my list since they sound like really entertaining and ‘easy’ reads (which is something I need right now since I don’t have a lot of spare time to read). My newest TBR jar pick is The Hired Girl by Laura Amy Schlitz. This entry was posted in Book Memes, WWW Wednesdays and tagged a court of mist and fury, a study in charlotte, alafair burke, book memes, brittany cavallaro, cascadia, danielle paige, h.w. buzz bernard, heart of tin, julie buxbaum, laura amy schlitz, marina keegan, phyllis edgerly ring, sarah j. maas, tell me three things, the ex, the hired girl, the munich girl, the opposite of loneliness, www wednesdays by Yvo. Bookmark the permalink. The only book I have heard about from your list is The Ex which I also look forward to reading. Munich Girl looks good too so all the best in finding time to read it. Happy reading. I’m going to try and finish The Munich Girl today since I’ve already reached the 75% and the pace is fast. And I think I’m going to pick up The Ex after that while I read ACOMAF in between… I’m in the mood for a mystery/thriller and that one sounds really good. I’ve heard lots of good things about The Ex. I’ll look forward to hearing what you think about it (although I imagine it could take you a while to get there because ACOMAF is huge!!). I hope you enjoy ACOMAF. I will be anxious to see what you think. I haven’t decided if I’m going to read it or not. Tell Me Three Things is definitely a quick and fun read. I think you’ll fly through it! That’s too bad. I’ve only the first and second book, but not the third or any of the novellas. I made the same mistake when I picked up my copy of The Opposite Of Loneliness, but in fact more than half of the memoir is made out of fiction short stories. Definitely something to keep in mind. 😉 Happy reading! Love the sound of A Study in Charlotte, think I will add this to my wish list, thanks! A Study In Charlotte is definitely a better choice! It’s a series as well, but can be read as a stand-alone. I was finally able to finish it today, and it’s definitely worth reading! It mixes historical fiction with contemporary (romance) elements and overall it’s a great read. I’m sorry ‘Heart of Tin’ didn’t do much for you. I hope you enjoy the next books more. Happy reading and thanks for participating in WWW Wednesday! Luckily The Munich Girl was a lot better and my newest read is looking interesting as well. 🙂 Happy reading and thanks for hosting! I just finished Tell Me Three Things and liked it so much! Hope you like it, too! I’ve heard great things about Tell Me Three Things. I hope you enjoy it. I’ll be watching for your review! I’ve heard great things about it as well; I’m definitely going to pick it up soon! I hope you get more reading time soon 🙂 I always get pickier when I don’t have much time to read. Hours are limited so I try to choose books that I am pretty sure I’ll enjoy. I am so intrigued by A Study In Charlotte that I probably will get it soon. I am focusing on the Throne of Glass series, so I don’t want to start another Sarah J. Maas series, but I keep seeing ACOMAF everywhere! Very true, I’m trying to pick titles that I will most likely enjoy as well right now. A Study In Charlotte was definitely one of them! And I get why you would want to wait with the ACOTAR series; having to wait for the releases of the sequels of both series is even more painful than waiting for just the Throne Of Glass one, trust me! 😉 I think I actually like the worldbuilding in ACOTAR better, but the Throne Of Glass sequels are awesome as well. That is why I stayed away from series for a long time. Patience is not a friend of mine, haha! I think I’m the outcast/black sheep when it came to reading A Court Of Mist And Fury. I look forward to see what you think. I’m hoping to finish it this month, although I haven’t been in the mood for fantasy and also a bit afraid some things will happen in the sequel that will make me like the series less… I really should continue it soon though! Good to know! I’m going to try and pick it up again soon then. Ooh, these are almost all new books for me! I’ll definitely be looking into a few of them! 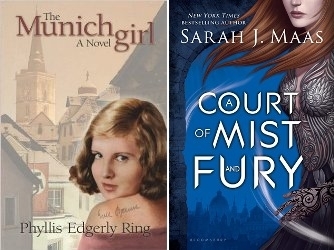 I love Sherlock Holmes & historical fiction, so consider A Study in Charlotte and The Munich Girl at the top of that list!